I had kind of a long lunch break today and ended up checking out a CF MOTO side by side at a somewhat local Honda dealer. At first I thought it a RZR but didn't see any signs showing this dealer being a Polaris dealer. So, had to make a u-turn and go over the place and check them out. Actually quite impressed with the design, fit and finish of this side by side priced with a roof for 7995.00. They offer a 51" width which allows them to hit most trails. The owner of the store said he had two of them at home for demoing and has been running the crap out them. He says that on the trail has no problem keeping up or staying ahead of his buddy on his RZR 800 but on a all out drag race the RZR takes the win. They come equipped with a bunch of stuff that would add on some serious dough to the price of a Polaris RZR. Interesting for sure! I'll share some live pictures shortly. Until then, here is a stock photo of one. Something else I might note: The 2012 models come stock with a 3500lb winch and even nice allow wheels than the 2011 pictured. They are coming out with a wider stance model with long travel suspension with the next year models which are close to arriving at dealerships nationwide. 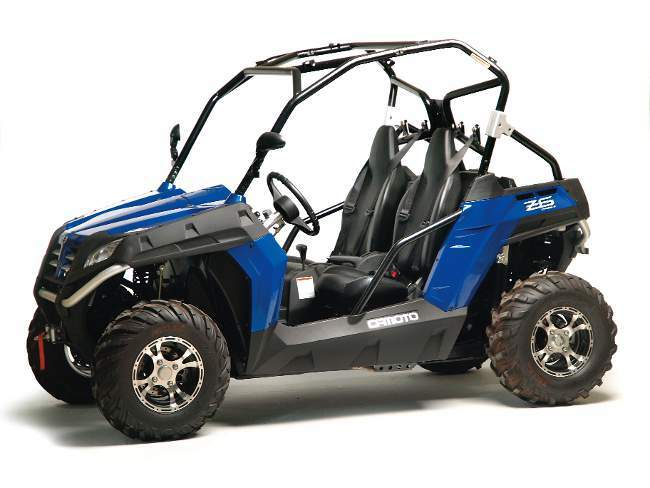 The manufacturer uses many components made for Polaris at the factory down the street; for example the instrument cluster. They have been manufacturing engines and components for over 30 years in Asia. I believe the name they sell under in Europe and Canada is called a Snyper. That's about right. I just paid over $12k for a RZR 570 and you show me this? Coulda bought a lot of diesel for the difference. Oh well, the RZR's gonna be a lot of fun. Forrest sounds like already hooked up with RZR. I'm out looking for a end of year bargain myself. What is the stance or tire width with your RZR 570? These come with a 1 year full warranty and they have the full harnesses standard which I liked. Our local dealer prices them at a grand off factory MSRP. I have the 50" wide model and plan to keep it that way. Won't do much to it, half windshield, soft top, cv guards. Polaris really should have a better warranty, there is a dealer that has good prices on Polaristar extended warranty so I'll probably do that later. Nice! I could have some fun in that.